This is a persuasive and well-supported argument that readily available treatment is the way to combat the massive problem of drug abuse in the US. Massing knows of what he speaks. As a contributing editor of the Columbia Journalism Review and frequent contributor to the New York Review of Books (he was also a 1992 MacArthur fellow), Massing has been reporting on US drug policy for ten years. He finds, as do most others studying the topic, that we are losing the war on drugs. Despite spending billions of dollars every year, drug production, distribution, sales, and use continue to flourish. Our current policy, focused on interdiction and punitive measures, has not worked; yet neither, for the author, will legalization nor harm-reduction or maintenance (how does one maintain a crack addiction?). What will work, because it has worked in the past, is a nationwide network of clinics providing treatment for all who want it. 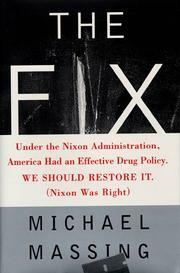 Surprisingly perhaps, this is precisely the drug policy we had under the Nixon administration, but under the Reagan administration, for ideological and budgetary reasons, a treatment approach was largely abandoned. It’s the detail Massing provides that makes this such an effective work. He travels from the street world of the addict in New York’s Spanish Harlem and treatment programs that work there, in particular one called Hot Line Cares, to the insulated and distant world of Washington drug policymakers. He discusses the personalities and processes that brought the Nixon policy into being and those that led to its dismantling. Massing finds that drug policies formulated in Washington have little to do with the reality of drug use in the street; his book is an attempt to bring the two worlds together. The passion and care of the writing make this an important contribution to the debate on what our drug policy should be and how it should be formulated.